A Manitoba animal-rights group says video footage of distressed and dehydrated pigs being shipped to slaughter shows the need for changes to animal welfare laws and industry regulations — although the government agency responsible for enforcing livestock transportation rules says those regulations weren't violated. "What we saw is pigs that were extremely dehydrated. They were frothing at the mouth, they were overcrowded, some of them were climbing on top of each other. They were in extreme distress — they looked very upset," said Cheryl Sobie, an activist with Manitoba Animal Save. 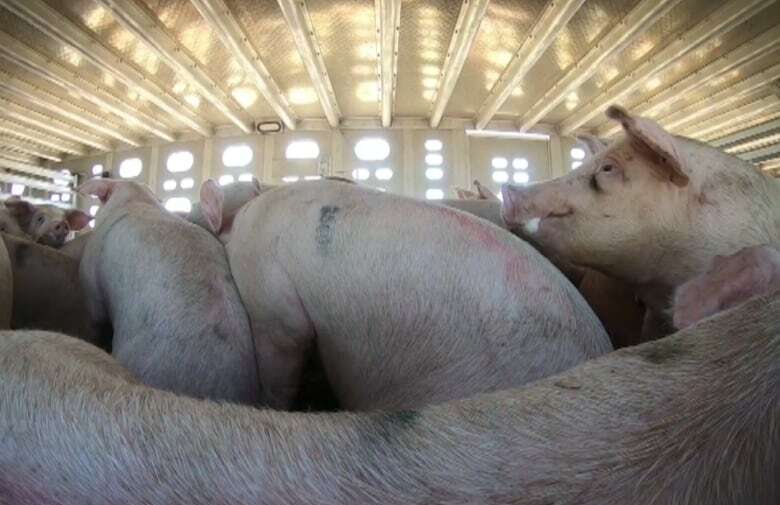 CFIA inspects after video shows pigs crammed into transport truck in B.C. We're outraged when dogs are kept in hot cars. Why not pigs in transport vehicles? She said the video was taken on July 13, between 11:45 a.m. and 1 p.m. CT, outside the Maple Leaf Foods facility near Brandon, Man. The video, the group says, is edited together from encounters with three different trucks. According to Environment Canada records, temperatures reached 29 C that day, with a humidex value of 35. Sobie said, "We actually found three violations, so we reported that to the CFIA [Canadian Food Inspection Agency] and they sent us an email back saying they did not find any violations." The CFIA confirmed it received the video from Manitoba Animal Save and determined the shipment was in compliance with the regulation requirements for transport. "The professional assessment of a CFIA veterinarian was that the load was in compliance with the Health of Animals Regulations and that the animals were not overcrowded for the weather conditions at the time," a CFIA spokesperson said in an email. The agency said the requirements that apply to all livestock transported in Canada include a prohibition on overcrowding that is likely to cause injury or undue suffering. They said load densities should be adjusted when there are warmer temperatures to maintain compliance with the regulations. The CFIA said its investigation is now closed. Maple Leaf Foods, however, says it doesn't like what it saw in the video. "The events that took place on July 13 were completely unacceptable and unfortunate. These animals were being transported by a third-party carrier and were in transit to the Maple Leaf Foods Brandon facility," said Greg Douglas, vice-president of animal care at Maple Leaf Foods, in an emailed statement to CBC News. "Maple Leaf is working in complete co-operation with the CFIA and we are in support of their investigation and conclusions. These events are unacceptable and Maple Leaf Foods is on record supporting long overdue changes to the federal animal transport regulations." CBC News has contacted Maple Leaf for further clarification and reaction to the CFIA's findings. The CFIA held public consultations beginning in December 2016 and is working on reforms to the regulation relating to the transportation of animals. Manitoba Pork, which represents the province's pig farmers, won't comment on the condition of the animals but says the measures taken by the activists to get the video were unsafe. "We are very concerned about the human safety issues in the video, especially of the person putting their hands inside the trailer as it was moving," said Andrew Dickson, general manager of Manitoba Pork. "A slip and they could be run over accidentally. We ask the public not to interfere directly in the operation of livestock trailers." Dickson said if people have concerns they should contact the proper authorities. The Winnipeg Humane Society, though, said the video raises concerns for the welfare of the animals in the trailer. 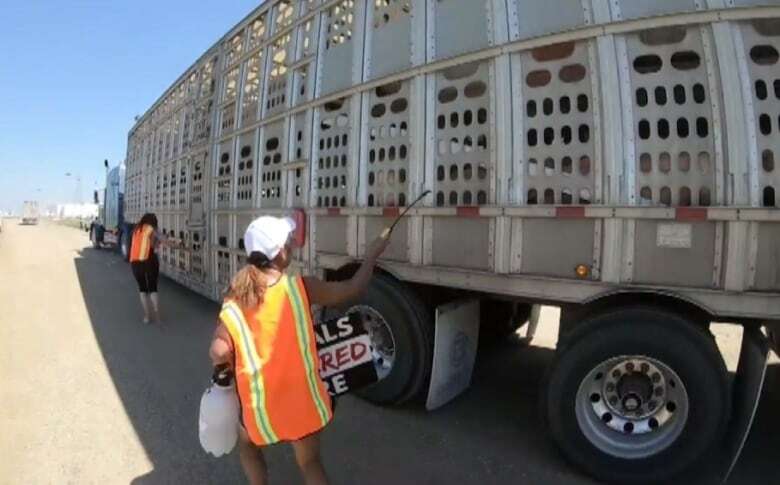 "From the hot temperatures to lack of space, this video displays numerous concerns associated with how animals are transported in Canada and the lack of laws and regulations in place to protect them," said CEO Javier Schwersensky in an email. "All animals deserve our respect and dignity, including farm animals." Schwersensky said the video shows the need for updates to Canada's farm-animal transportation laws. "Animals in transport should not be crowded. They should also have continuous access to water, be protected from temperature extremes and receive additional monitoring and assessment during transportation to ensure their physical and mental welfare." 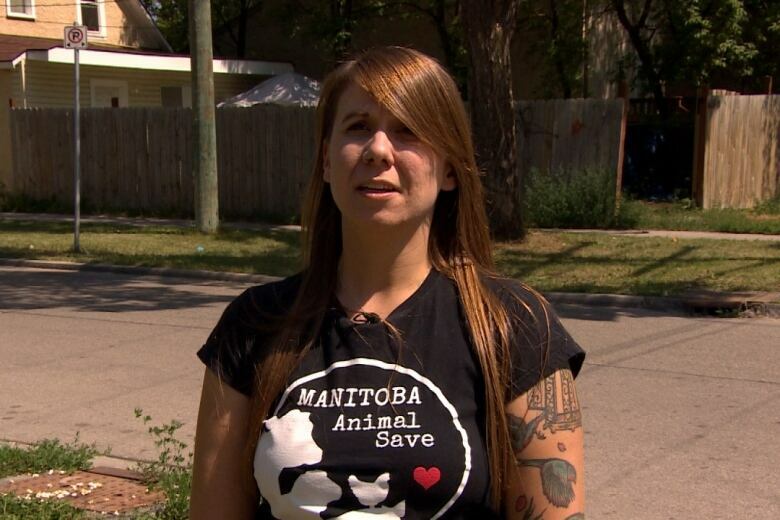 Manitoba Animal Save, which is based in Winnipeg, travelled to Brandon on the day the video was shot to document the conditions in which the animals are shipped and to raise awareness. "The point of that footage was to capture the animal cruelty violations," said Sobie — violations of regulations and laws she says aren't enforced by the CFIA. "It was clear violations. Anyone who watches those videos, you can see that these pigs are in extreme distress," she said. "If the regulations aren't able to protect these animals then I'm not sure why they even exist. To me it just seems like a smoke show." Manitoba Animal Save has met outside slaughterhouses in the past, including the Maple Leaf facility near Brandon last summer. The group also holds a vigil outside the Dunn-Rite Food facility in Winnipeg every Friday. Semi crashes with van, killing dozens of hogs near Morris, Man.